Organising and promoting an event can be difficult at times. Sometimes it seems impossible to get the right crowd to attend. There is no doubt that event promotion can be very frustrating. You have a great event organised but only a few people turn up. Our 1EM events team have over 25 years of experience in organising events ranging from small local networking events to customised master classes and from award dinners to regional exhibitions. And with the network built over the last few years in running the local networking events and the regional business awards, we have developed a comprehensive database of businesses enabling us to target and invite the right delegate to the event. Furthermore, our in-house engagement and outreach team combined with our dedicated associates, we can help find the right audience for your event, deliver all or part of the event and customise it to meet your needs. For more information, please download our Marketing Brochure or call us on 01254 790786. “Well organised event. Speed networking worked well.”. “The speed networking was brilliant, as was the food! 10/10!”. “One of the best networking events in the North West.”. “Excellent event helpful friendly team from 1EM”. “Great team, atmosphere and networking opportunities! Highly recommended for anyone who wants to expand their reach in a calm and productive environment”. “I would recommend new business attend 1EM Networking Events”. “Let us help you generate a return on investment from Expos. We have over 20 years of experience in attending, exhibiting and organising expos”. “With over 25 years experience, we can help you plan, organise and deliver high quality, well attended events”. “We help create business opportunities by facilitating speed networking events”. 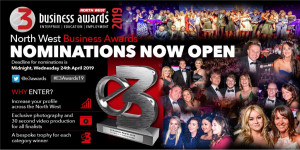 We are passionate and committed to promoting and connecting the North West business community.